That’s what second-grade teacher and MGM-devotee Caitlin Walsh believes. After being left at the altar by her ambitious rat of an ex-fiancé, Cait has rededicated her life to her students and to the citizens of small-town Ridgewood Grove. But when the school’s new financial director, Garrett Ellis, cancels the much-beloved Harvest Hoopla festival, Cait rallies the staff to fight the decision, which puts her in direct conflict with the most formidable man she’s ever encountered. As a reluctant heir to the Ellis Fruit and Nut Gift Basket Empire and the second son of one of the country’s most affluent families, Garrett has a penchant for mixing sweet edibles with acts of love. He also has an undercover agenda: to find the person responsible for stealing the district money and to right the situation, while keeping his family background to himself. But in the process, he faces the one woman who challenges his longtime resistance to commitment. Love and family complications abound in this small-town romance with a little humor, a light mystery and a lot of sweet ice cream. Double Dipping is the story of opposites colliding when a dedicated second-grade teacher fights the school’s new financial director in order to reinstate a much-beloved autumn festival. But secrets, ambition, attraction and meddling family members complicate matters in this small Midwestern town. 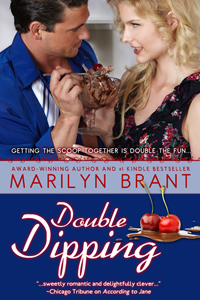 The book is part light mystery, part romantic comedy and entirely packed with delectable sweets — including a step-by-step recipe for making homemade chocolate-cherry ice cream. and some air-blown kisses for good luck. Caitlin Walsh knew good men were hard to find, so she rarely had high expectations. After all, what average American male could possess Cary Grant’s debonair charm, Gregory Peck’s effortless intelligence or Jimmy Stewart’s boyish enthusiasm? That’s right, none. So why bother with them? But that afternoon, as she sweltered in her second-grade classroom and scanned the new financial director’s end-of-August memo, she realized the average American male had just sunk to a new low. Cait stared at the ice cream, then back at the memo—unable to speak, unsure of what to do next. With the new school year starting tomorrow, she’d been prepared for the typical changes. But, Good Godiva, she’d never imagined anything this disastrous. She tossed the awful memo onto her desk and, despite the excess calories her “full-figured” (in Jenna’s diplomatic words) body didn’t need, she yanked open the pint of Raspberry Truffle Swirl and plunged her spoon into it. Ah, creamy heaven. In this tiny southeastern corner of Wisconsin, where the town’s motto was “Sundaes Save Souls” and the local doctors prescribed “two scoops” instead of aspirin, comfort was as close as a grocer’s freezer. After a few medicinal spoonfuls, she recovered her voice. “How could this Ellis guy cancel the Harvest Hoopla? He hasn’t even been the financial director for a week and already he’s cutting our favorite school festival?” This was her festival, dammit. The one she hosted. The one her students loved best. Other than tidbits their secretary Sonja divulged last week, Cait didn’t know much about Garrett Ellis, but she was willing to bet the elusive financial director was hiding out in a cave somewhere with his calculator, crunching numbers and dreaming up new methods to wreak havoc on their fall plans. “We know,” Jenna said around a mouthful of Butternut Pecan. “Who’s running the Coffee this year?” Loni asked. “Mrs. McAllister,” Jenna said, rolling her eyes. Cait groaned. She couldn’t bear the sight of that school-board-member-slash-socialite Shelley McAllister. Her obnoxious perkiness. Her smoldering red hair. Her evil attempts at sweet talking the administrators during meetings. That had to stop. “Mrs. McAllister certainly has a way of getting what she wants. We should insist on getting our way, too,” Cait said. The other teachers nodded, sympathy etched on their faces. “Is her memory loss getting worse?” Marlene asked. Cait inhaled and bobbed her head. Damn that Budget Man. On top of the kids’ disappointment and the staff’s frustration, how would she explain the Hoopla’s cancellation to her mother? She stabbed straight pins into a “Second Grade Welcomes You” poster and tacked it to the wall with a sense of permanency. “School administrators are as bad as deceitful politicians,” she muttered, a memory bubbling to the surface of her politically ambitious ex-fiancé Fredric. The callous jerk. She snatched the financial director’s vile memo, crinkled it into a ball and lobbed it toward the trash…missing by half a foot. Well, sports never were her strong suit. “Or maybe we’ll just get him,” Marlene said. Cait cringed and tried to tear her thoughts away from fruitless revenge fantasies. She could count on nothing but hard work, which was her life’s salvation alongside ice cream and MGM. But every time she’d played by the rules someone underhanded and conniving muscled his—or her—way into the center ring. She hated to make trouble, but if she didn’t stand firm for once she’d get shoved aside and forgotten. “You think this Ellis guy’s got any secrets?” she asked. Marlene and Loni shook their heads. Her friends were right. She’d do it! She’d make that man listen. The easy way or the hard way. His choice. “A gallon,” Jenna agreed. “Maybe two.” She crossed her arms and gave Cait an expectant look. Outside the building, Garrett Ellis swiped a few beads of sweat off his brow and tried to provide the school district’s anxious superintendent with the calm reassurance he needed. “I appreciate both your skill and your discretion in handling this matter.” The superintendent extended his palm. And he would. He was a big believer in hard work on the job. At least when it came to jobs he had some skill at and marginally enjoyed. But he couldn’t stop wondering just who had recommended him for this position. It must’ve been one of the East Coast CEOs he’d worked for earlier this year, though none of them had mentioned anything. He sure hadn’t gotten an endorsement from his father. The older administrator shuffled away before Garrett could work up the nerve to ask and, besides, he wasn’t about to look a gift horse in the mouth. He knew the superintendent had given him an opportunity to right a district wrong and, equally pressing, he’d given him a chance to prove himself to his dad. A chance Garrett desperately needed. Because one thing was for damned certain, with his father’s angry statements still ringing in his ears, he couldn’t go back to Connecticut if he failed here in Wisconsin. With added resolve, he took a deep breath and marched toward the school. Cait whipped the lid off an activity box and dropped it to the floor with a clunk. She tossed some folders onto a kid’s desk and glanced up again at the clock. Another twenty minutes gone and still no Ogre-ish Budget Man. Huh. She’d tried to find the guy, but his office was locked. Figured. So she’d scribbled a message for him to find her, tacked it to his door and took out her fury on the remaining boxes. In an unpacking frenzy, she displayed the puzzles, put away the new stash of construction paper and arranged the language arts worksheets. Where the heck would she get the money to purchase the rest of the supplies she needed, though? The ones the school was too thrifty to buy this year? Pain-in-the-neck Budget Man at it again, no doubt. Still, she surveyed her mostly completed room with pride. Here were concrete lessons. Well-organized activities. The one place in the world where she felt in control. At the double knock, she turned toward the door. A man stood in the doorway—a lean, tall figure, claiming the space. She froze. A visceral reaction rooted her sneakers to the ground. Dark, wavy hair. Chipped-chocolate eyes. Enticing lips. A distinguished jaw line. And somehow she knew instinctively it was The Ogre. Only he wasn’t, was he? The man before her might be pure evil, but Holy Hollywood, he was Cary Grant reincarnate. He narrowed his eyes at her, very slightly, but she noticed. Now there was a genius remark. Making it out to be her problem. His insinuation made her curse power-hungry males everywhere for their absurd games. “Not quite. There are set-up and clean-up costs.” He appraised her with an adversarial confidence. Her temper flared. “I’d appreciate your attention without interruption.” She waited until he closed that mocking mouth of his. “As I was trying to say, Mr. Ellis, only a small portion of the school’s extracurricular budget is used for decorations, advertising and incidentals.” She raised her palms in question. He raised his eyebrows in response. Cait didn’t think men in their early thirties still snorted, but Garrett Ellis was an exception. His sarcasm made her skin itch. “Well, we also have a storyteller,” she said. He creased his brow, clearly unimpressed. An odd expression crossed his face. “Sorry, Miss Walsh, but there’s more to it than that.” Of course he didn’t deign to elaborate. He took a couple of steps forward and picked up the crumpled, trodden memo. “Mine, I presume?” He actually had the nerve to wink at her before tossing it in the trash. “What’s this?” He pointed to her list with the words STILL NEED written in red marker along the top. “The parents have already been sent a list of over twenty school supplies they need to provide. I didn’t put these things on their list because, in past years, the school has purchased them. Not this year, though.” She crossed her arms. What would Budget Man say to that? She studied him. He had the classic glint in his eye of a player. The kind of man who’d switch allegiances—or women—like airport rent-a-cars if someone got in his way or if his ego got neglected for five minutes. She knew men like this. Guys just like her ex-fiancé Fredric. They didn’t spill secrets easily, and they always, always had ulterior motives. Garrett watched the curvaceous blonde throw a few last things together, and he shook his head behind her back. This was exactly the kind of individual who could get away with skimming budget funds if she wanted to. No one would suspect someone as lovely and as, well, wholesome-looking as Cait Walsh. Not of fiscal misdeeds. Still, it would be bad form to deny a teacher her glitter. The school board had approved the office supplies change, but he wondered who’d orchestrated it and why. Something seriously strange was afoot in this district. He studied Cait. She was young, dynamic and closer to his sister’s age than his. Twenty-five, maybe. But unlike Sis, this shapely woman was a neat freak who used round vowel tones as weapons. She challenged him with that reserved posture, that combination of clarity and caution. With those huge gray-green eyes, freckle-splattered nose and forehead creased in concentration over God knew what, she was cute as hell. Which annoyed him. He had too much to do. A leak to pinpoint. He had no intention of finding anyone “cute as hell.” Least of all a potential embezzler from Wisconsin. He saw her lift a bulky beige tote with the letters “CLW” stitched in green. It looked as heavy as a golf bag, but shorter and twice as dense. She had it crammed with papers, scratch ‘n’ sniff stickers, lots of stuff he couldn’t see. He’d have offered to carry it for her, but she grabbed it tight. Didn’t look like she’d trust the FBI with that thing. Huh. Suspect behavior. “None of the above.” Cait locked her classroom door. Then again, maybe secrecy was just part and parcel of being a woman. They always thought they had to be so mysterious. She nodded, standing still and staring at him in the hallway. He puffed out some hot air. He’d have to brush up on his chitchatting. Not a good idea to alienate the staff so soon, even if he had suspicions about somebody. He’d known her for…what? A whole fifteen minutes? And already she pretty clearly despised him. Well, never let it be said he couldn’t make a strong first impression. “I won’t laugh.” He tried to radiate sincerity. A laugh erupted from deep within him. So there was a sense of humor behind the snow queen façade. Good. Maybe she’d thaw a bit, they could talk, he’d figure out her angle and, hopefully, discount her from his investigation. He needed to concentrate on forwarding his career…and on keeping his father from disowning him. Ogling attractive women was his brother’s department, not his. “I did.” She surprised him with a grin that lit up her whole face. For a moment he was rendered speechless. They strolled outside toward the parking lot. “Oh, don’t be so sure. Your parents altered yours from your namesake’s to be less embarrassing, my parents did nothing of the kind.” He hesitated, praying she’d back off. The name recognition, he knew from years of painful experience, could be instantaneous. But no such luck. This Miss Walsh was a persistent one. “I wish,” he muttered. And he did. For maybe the ninety-thousandth time he wished he came from a family that wasn’t internationally famous. He opened the passenger door of his red BMW and held it for her. She slid into the black leather seat, her eyes bulging at the rows of gadgets on the dash. He knew how impressive it looked. He liked his cars complicated, his women simple. Yet another reason the chilly and changeable Miss Walsh posed a problem: She did not seem simple. But someone was meddling with funds and, although instinct and experience told him Cait didn’t have the bearing of a ringleader, she might know who was at the center of these thefts. He slipped into the driver’s seat and retrieved a second list from the glove compartment. Time for a test. She gave a curt nod and laced her fingers together, looking about as enthusiastic as a shop mannequin. Within ten minutes, he had them parked in front of Bookends. First they’d book shop, then they’d drive to the supplies store. His two-part strategy to relax, converse, slide into informality. He’d try to find out what she knew, if anything. If he could rule her out, he could get back to investigating the problem. Alone. Garrett leaped out of the car. “You coming in?” he asked as she sat, pensive, in the passenger’s seat. “Okay.” What could he do? Garrett tossed her his car keys. “If you want music, feel free to pop something in. CDs are in a case under your seat.” At that she looked almost intrigued. “Thank you.” Cait doled out one of her angelic smiles. It made him tense, uncomfortable and kind of…warm. Aw, hell. He took a few brisk strides across the street toward the shop. He had a job to do, he reminded himself again. He didn’t need complications like, oh, lady swindlers. But he hoped to heaven she was innocent and he could maintain a friendly distance from her. Something about this woman just got to him. A point underscored by the fact that, as he entered the bookstore, he found himself wondering what he might buy her to make her smile again.